Quickoffice, a productivity app maker, has been on Android Market (s goog) for more than two years and has struck a bunch of deals with manufacturers to get its free app preloaded on to Android smartphones and tablets. In the spring, the company launched its free and paid apps on Amazon’s (s amzn) Appstore for Android, but paid sales of the apps on Amazon were at times 1/100th of what it was making on Android Market. In the last couple weeks, however, there have been days when Amazon sales of Quickoffice has been on par with Android Market and it comes down to one simple reason: the Kindle Fire. Quickoffice CEO Alan Masarek told me he’s seen a massive lift in sales of his Android app on Amazon thanks to the successful launch last month of the Kindle Fire, which has proven to be a great showcase for his app. As with many other tablet makers, Amazon has preloaded a free version of QuickOffice on to the device. But the company is seeing much more success in converting those free users into paying customers compared to other Android devices. QuickPro Office Pro, which sells for $9.99, is No. 18 on the Amazon Appstore paid app rankings. It may speak to the number of tablets Amazon has sold, though it’s still unclear how many actual units have been moved. Developers I talked to are not disclosing data that would provide a gauge of Kindle Fire sales. But the early sales boost seen by QuickOffice and other app makers also appears to come down to the elegant buying experience Amazon has created on the Fire. The whole product gives developers a lot of reason to be optimistic about Android tablet apps, which have generally been a big disappointment. “It’s been a massive difference for us; we’re doing very well on the Amazon store,” said Masarek. Masarek said other Android devices have not been as lucrative for developers because they often don’t have a user’s credit card on file. With the Kindle Fire, Amazon is able to provide a more Apple-like (s aapl) buying process, starting with a curated selection of apps and ending with a one-click check-out. And it’s got a very easy-to-use UI with a prominent storefront for apps. Masarek said that’s been helpful in kickstarting sales of Quickoffice, which shines best on tablets. “The Kindle Fire is providing disproportionate benefit. If Amazon sells one unit and another manufacturer sells a unit, because of the benefit of the integrated purchase experience, you would expect to see better conversions on Amazon and that’s what we’re seeing,” he said. Sylvain Dufour, CEO and founder of mobile game maker Mobigloo said Amazon’s tablet breaks an unfortunate cycle for Android developers, who have struggled with Google tablets. His app Pinball Deluxe Premium is sitting at No. 15 on the paid app rankings after previously hovering between 70th to 90th. It’s been helped in part by a price cut in the last week, but Dufour thinks that Amazon’s clean buying experience has helped create what he calls a “dramatic” increase in sales, especially for an app like his that works best on a tablet. He said the way things are going, he expects that Android Market will be the place where he primarily distributes free apps, while the Kindle Fire will be where he does more actual selling of apps. He said he thinks the ratio to free apps sold on the Fire to paid apps is perhaps 10-1, while on Android Market, he guesses it could anywhere from 20-1 to 50-1. “I think the main difference is because people on Amazon and the Kindle Fire, they’re more serious about buying. Even if they want the free version to start there’s more of a chance of them to convert. Even if Amazon is just one channel to sell Android applications, over night since the launch of the Kindle Fire, it’s become a very serious channel to sell a product,” Dufour said. 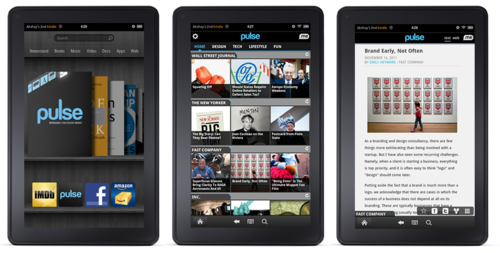 It’s not just paid apps that stand to do well on Kindle Fire. Pulse, a free news reading app, was bundled on the Fire and has enjoyed a boost in the number of people who are using the app. “Our servers are definitely getting strained (by Kindle Fire users) but we’re very pleased with the way things are going so far,” said Akshay Kothari, co-founder of Pulse. Pulse, like QuickOffice, was first contacted in the summer by Amazon about a deeper relationship. That ultimately led to integration on the Fire, though Kothari said Amazon didn’t disclose it was working on a tablet until the actual announcement and didn’t tell Pulse it was going to be placed right on the front screen. A little bit like Apple, Amazon tends to play it close to the vest. Kothari said he’s excited about the prospect of distributing apps on a new tablet, especially if analyst forecast prove correct and Amazon sells up to 5 million units this year. He said the Pulse team tweaked the app with suggestions from Amazon, cleaning up the reading view and dropping in sharing connections that allow users to send articles to other downloaded apps. Though the Kindle Fire represents more work for developers, Kothari said it’s worth it and not unusual for Android developers. Developers already have to test their apps on a wide variety of smartphone and tablet configurations. And some optimize their apps to be pre-loaded by manufacturers. Adding one more manufacturer, especially one that has the potential of Amazon, is an easy choice. 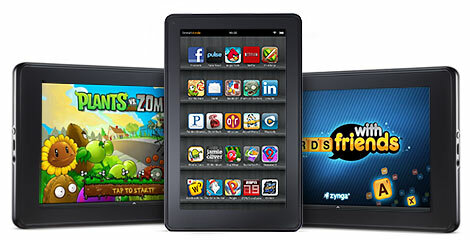 It’s not just developers who see opportunity in Kindle Fire. Ted Morgan, the founder of location technology provider Skyhook, said the device represents a big opportunity for his company because the Fire doesn’t come with GPS embedded. But Skyhook can enable apps to be location-aware through its SDK, which it has been getting developers to use. Google has stopped using Skyhook in favor of its own technology and has allegedly pressured manufacturers to deploy Google’s technology instead, a claim that is now the basis of a lawsuit by Skyhook. But now with a new hot tablet on the market, Skyhook has a way to go after makers of location-based apps, selling them on not only its own technology but the fact that it will enable their apps to work on the Fire. “We’ve seen a lot of enthusiasm on the developer side for the Fire, but all their location apps are kind of hosed so we’re reaching out to all of them,” Morgan said. The emergence of the Fire still has some adverse implications for developers. It’s not as open as Android Market and requires a review by Amazon to be listed in the Amazon Appstore. Amazon still has the ability to price an app as it sees fit. And if the Fire becomes the most popular Android tablet, it has the potential to be a gatekeeper on apps, something Instapaper developer Marco Arment noted in a blog post. But it says something about how mediocre the sales prospects were for Android tablet app makers that they’re so excited about the Kindle Fire. Things may balance out with new Android tablets based on the Ice Cream Sandwich software. But Amazon’s selling savvy, which it’s proven on the web, is not only getting consumers to take note, but developers as well.